If you were looking for an ideal opponent to play in the first game following Joel Embiid's injury, it would be hard to select a better candidate than the Atlanta Hawks. With just two wins in the month of March and most of their good (relatively speaking) players on the mend, they never had a real chance against the Sixers. But it was good to see Philadelphia come out and kick their butts anyway. You never really know how a team will respond to adversity until they're presented with the opportunity, and the Sixers took a nice first step with a 101-91 win over the Hawks. The result was not anywhere near that close — you can credit the Sixers' woeful garbage time performance for the misleading scoreline. By the time the game reached the midway point of the third quarter, the Sixers were already in cruise control, and that's a script they'll hope to repeat with a few more cupcakes left on the schedule. If some of their primary contributors play like they did on Friday, Philadelphia can pull it off with no problem. There are nights when you look at a guy dominating an opponent and think to yourself, "Man, he really knows he's the best player on the floor." And then there are times like this Hawks game, where Ben Simmons not only thought that, but appeared to be actively screwing with the city of Atlanta in the process of tearing them apart. Simmons came into the game well aware of how bad the Hawks are; during a conversation with Timberwolves forward Karl-Anthony Towns earlier this week, Simmons joked that his friend had all night to stay up and game with him because he only had to play Atlanta the next evening. It proved prophetic, with Towns breaking Minnesota's single-game record for points scored. So perhaps it shouldn't have been surprising that he played with a little bit of extra flare on Friday night, as if to challenge himself in a game where the opponent offered little resistance. He finished with his 11th triple-double of the season, and he came up with the 10th assist in style, using a look away to set up a Richaun Holmes flush in transition. The most heartening thing about Simmons' performance was the steadiness of it all despite losing his best teammate. He played within himself and didn't try to become a player he's not, and instead went through the usual routine of picking and choosing his spots en route to another quietly dominant game. Triple-doubles certainly aren't everything, but they are at the very least a reflection of a player's ability to impact the game across the board. And Simmons is picking these up with alarming regularity these days — it's his fifth in the team's last 10 games, a number that would put him in the top-five for the entire season. He didn't just break through the rookie wall, he completely ignored it. "If it weren't for me taking him out of, I'm saying it's four games at least, we would be talking about his 15th triple-double," said Brown. "I think he triggers our passing, we broke an NBA record tonight with our eighth consecutive 30+ assist performance this season, we just went by the Golden State Warriors. We're proud of that. We're proud of our ability and willingness to share the ball. He's the best we have on our team at it, and I think it inspires others to move the ball as well." Moving forward, we'll see if Simmons is able to play the same calm and collected game if they're in a tight battle down the stretch. He did slip into attack mode at times throughout the game, challenging Atlanta's defenders to stop him at the rim. They were not up to the task, as you might imagine. If the big man watching at home had any doubts about how his team would hold up, Simmons helped hush those concerns. He even sent a brief message to Embiid during his post-game chat with Molly Sullivan, telling the franchise center it would all be okay. "Get ready for the playoffs," said Simmons. "We're going to hold it down." Simmons did not get the Sixers over the line by himself, by any stretch of the imagination. But with Dario Saric and Robert Covington struggling to get it going from beyond the arc, the Sixers desperately needed someone to step up and score in Embiid's absence. Enter Ersan Ilysasova, a member of these Atlanta Hawks until this February. It's probably not accurate to call this a revenge game — do you really need revenge on a team that set you free to play for a much better one? — but Ilyasova came ready to play, and he crushed his old team to the tune of 21 points and 16 rebounds on 8/16 from the field. Ilyasova offered a little bit of everything on both ends of the court, which is no surprise if you've been paying attention to Brett Brown's rotations. He moved back and forth between the two frontcourt spots, offering credible enough defense at the five to justify playing there for stretches. "I thought he was good all over the place," said Brown. "Him playing at a five is a challenge for other teams. I really feel like he can cause problems defensively for them with his ability to step out and stretch the floor." 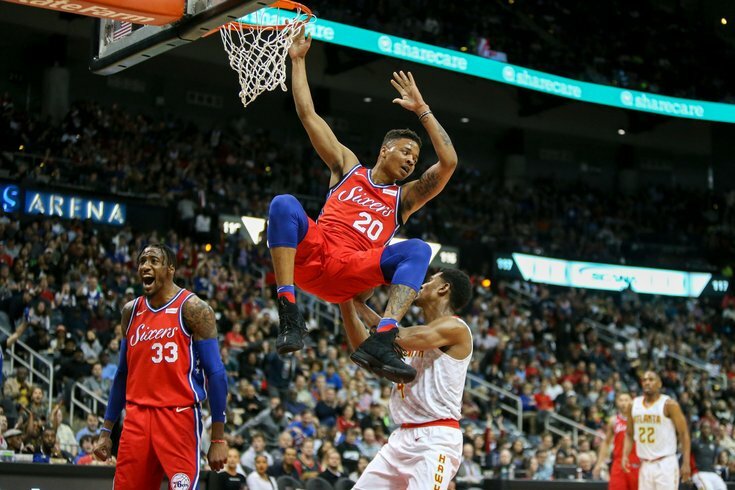 Brown clearly has very little trust in Richaun Holmes as a backup center. Otherwise, the younger player with more upside would have beaten out Amir Johnson for the spot behind Embiid. So Ilyasova stands to gain a ton from Embiid's absence, both in the form of minutes and responsibility on both ends. I'm not exactly a fan of the Marco Belinelli experience — sometimes shooters who never defend are not my cup of tea — but Ilyasova is the perfect style of veteran for this team. He competes at both ends, hits threes at a respectable rate, and can generally be counted on to be in the right place on defense. Ilyasova is never going to jump out of the gym, but the instincts that allow him to draw charges also put him in position to contest (or even block!) shots. His plus/minus ended up looking like garbage after all was said and done, but that was more about the all-bench unit's ineffectiveness to close the game. Even if Ilyasova probably dominated the ball a little too much at times, his spark off the bench was badly needed. For the third straight game, Fultz looked credible and in control running the second unit, which should not be taken for granted. He has shown a lot of maturity in the way he has handled his role so far, and the concerns about him throwing the chemistry out of whack seem misplaced now. The beauty of Philadelphia's comfortable lead was that it provided Fultz a bigger platform of minutes. Brown had him play nearly the entire fourth quarter, and he took several timeouts that he admitted were in part to improve Fultz's game fitness. "I'm trying to get his conditioning up," said Brown. "I thought he was okay. I thought he made some big plays, he had that incredible dunk, he comes up with loose balls when you think he's completely out of the play ... I think he's getting better." His mid-range jumper is certainly improving if nothing else. With the game firmly out of reach in the fourth quarter, Fultz uncorked a beautiful shot as he faded sideways away from the basket, and it's the sort of shot you saw him make with regularity at the University of Washington. We just can't pretend the Fultz we're watching today is the same kid we saw in college, unfortunately. The three-level scorer is more like a 1.5 level scorer at the moment, relying exclusively on tough mid-range shots and finishes at the rim in order to get his buckets. Though Denver and New York came out and showed Fultz a least a modicum of respect as a shooter, Atlanta did no such thing on Friday night. For most of the game, they played him as if he was Simmons, a complete non-threat to shoot from downtown. Frankly, they're correct right now. Fultz isn't even thinking about rising up and shooting from the perimeter, and at this rate it seems that won't happen this season. The concern level here depends on the lens you're looking through. T.J. McConnell almost has to be goaded into shooting from downtown, and nearly always settles for the extra pass or a drive instead of an open shot. In that sense, Fultz is a clear upgrade from McConnell — he's bigger, more athletic, and more of a threat to finish at the rim, which changes the calculus on how you defend him when he heads toward the bucket. But from the widest possible view, you have to be concerned about Fultz's unwillingness to take threes. He was drafted and traded for because his shooting was supposed to unlock the ideal combinations for Simmons and Embiid, and that reality looks really far away right now. To show you what I mean, here's a compilation of clips from his outing where he was given plenty of space to let it fly on the perimeter. The results were all over the place, from deferring to dribbling into a contested two to pulling off an insane finish at the basket, but they're all connected by what you don't see. This is a long way of saying to move forward with caution as it pertains to Fultz. Considering the context, I think he has actually been better than a lot of people expected him to be through his first three games back, and no one should expect this to be how he plays forever. After all, a lot of us were convinced he wouldn't play again this season. Just don't confuse what he is able to do with what he should and needs to be able to do. Patience is warranted, but his style of play is worth monitoring until he begins to look like the player most experts believed he could be.